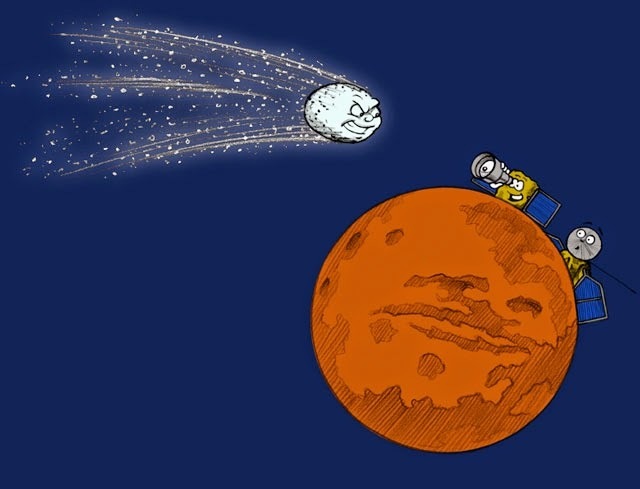 The space enthusiasts around the globe were preparing for an exciting moment: on how the two visitors from earth would be able to make it to planet Mars in the 3rd week of September. The team at NASA was quite confident on their 485 million dollars worth baby, MAVEN; while the Indian-MOM ($ 75-millions) was carrying ONE billion hopes to be able become the FIRST country to make it on their first attempt to planet Mars. Suddenly the focus has shifted to an event which would occur a month later, truely a Cosmic Spectacle which is going to take place if you were to be on Mars on Oct.19th. The comet Siding Spring will be zipping past almost at a distance of 1/3rd of that of earth-moon. When the Indian Mars Orbiter Mission, MOM was getting ready; there were few whispers around on the suspected visit of an intruder on Mars (indicating whether the mission should go ahead ???) ; credit to the think tank of ISRO that they went on record to announce that the mission is ON. 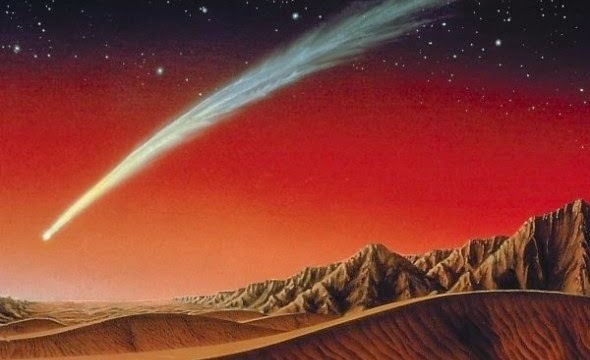 In one of my earlier posts (link), on my personal behalf I had predicted that even if the comet were to make it; this would offer a life time opportunity to study this event. This is precisely what has been the mood all around the globe today. It is a rare among rare opportunity that the space scientists would be getting to study a comet at such a close range. Siding Spring, a long period comet making its visit for the first time to the solar system has stirred huge interest among scientists and a common man. The good news: as per recently carried out modelling study (JPL and few other university teams) on comet's path around the solar system, the comet's nucleus with a size of around 2-kms will be moving within a distance of 132,000 kms from the planet; even then it is 17-times closer than the nearest recorded comet (L1 Lexell, 1780) in history. At this distance both the ion-tail and the dust tail is going to miss the Mars. 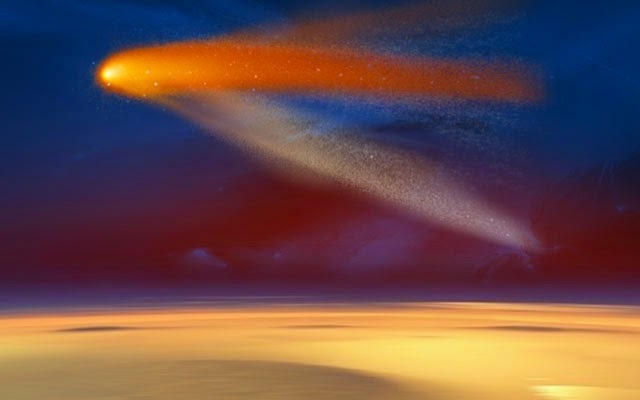 The bad news: is all due to a trail of dust particles which would be moving at a very high relative speed of around 57-kms per second during the closest visit of this comet; this would start 90-minutes before and would be lasting for another 20-minutes of actual passing time. As per the estimate of scientists, at these speeds even a tiny dust particle of half millimeter size could cause appreciable damage; "essentially they pierce the skin of any satellite; they would be like bullets, out there" quoted by Rich Zurek of JPL. 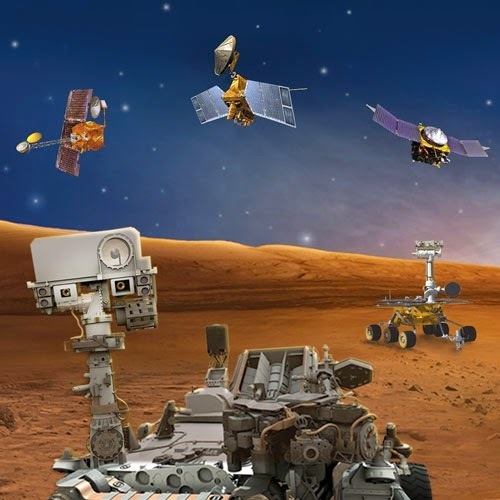 Presently there are two orbiters: Mars Odyssey, Mars Reconnaissance Orbiter and two rovers: Opportunity, Curiosity of NASA while one orbiter from ESA: Mars Express. The fuss is all due to the devastating effects this unexpected visitor to Mars would be causing; but... hey.. hang on.. this has now become a talking point on every possible popular scientific forum... because the fear of damage to the probes is turning into excitement of observing this unique phenomenon. The scientists at NASA have already come up with a plan of taking their orbiters behind the Mars planet during the passing-by phase of the trail of cometry particles. Both the orbiters of NASA have gone through the first level of orbit correction; they have also indicated that the newly arriving MAVEN would also be placed in an appropriate orbit to be placed itself behind the planet during the comet's transit. While the Indian team at ISRO is yet to make an official announcement to this effect. 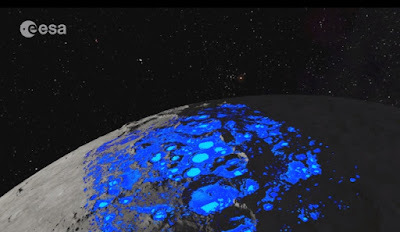 However, the scientists at NASA believe that the rovers on the ground will be under least amount of facing any kind of hazard and hence have not opted any protective measures. Though this may lead to a technical discussion (and hence elaborations are avoided); the indications leading us to believe that the NASA team has made elaborate arrangements in terms of preparing the suitable instruments on their orbiters and rovers to be ready for the cosmic spectacle to study the : comet/coma as such, coma-mars atmosphere interaction and also formation of Martian Aurora which may occur due to the interaction of coma and higher part of Martian atmosphere, as pointed out by David Brian, LASP, Univ of Colorado. Last but not the least, we, here in India will also be cheering for the MOM to catch up with the huge amount of opportunities which are thrown open during the nature's display of fire show. The object which is furthermost away to planet Mars and still part of it is Deimos, the second moon, is going to take a heavy beating on October the 19th. 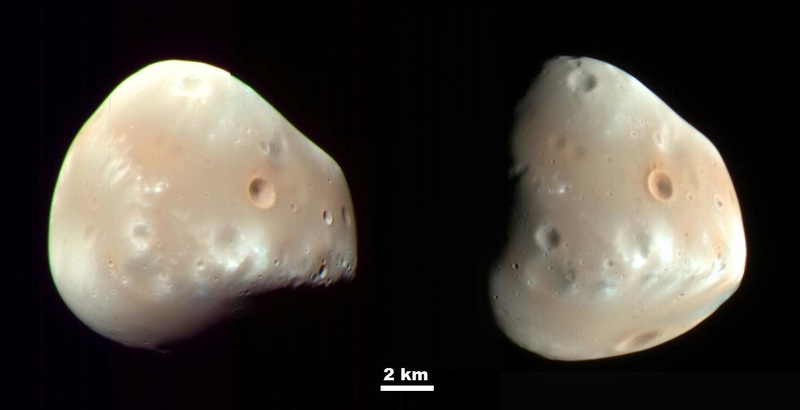 Poor Deimos with a diameter of around 13-km which has been spending very quite time all around, but situated around 23,000 km from Mars would be awake to a violent shower of particles (bullets) both neutral and ions. It will be interesting to note the fate of this object which is having a porous regolith (1.47 gm/cm3) .